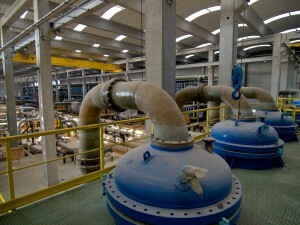 As part of a story on environmental issues I had to go to the new desalination plant near Llobregat. I was quite excited about this as I am fascinated by big machinery and modern architecture. It was pretty interesting, I loved all the bright primary colours used for different pieces of machinery, in the shot opposite you can see this but alas, also, the fact that everything seems to be covered in a dull carper of a dust. The trouble is that the construction is still in progress and large parts of the interior are in fact open to the elements and on this particular day there was a strong wind bringing alls sorts of dirt with it. I would have been tempted to try and clean some parts but this would have been totally impractical. I was shown around by a nice young woman whom I correctly guessed was from Galicia because she had these amazing green eyes, of course even with a friendly guide, you cannot relax in the same as when left alone and photographing things like this need some contemplation in finding the best shots.